A: Unlike the classic ladder & squeegee method, the water-fed pole allows the cleaning team to reach panes from the safety of the ground. The retractable rod is 22 metres tall and can easily reach even blemishes on the fourth floor of your premises. Q: What other cleaning possibilities are are contained within window cleaning Shadwell? A: Besides providing meticulous exterior window cleaning, the licensed technicians can also conquer and polish any commercial skyscraper – a service known as rope access window cleaning. Finally, the cleaning adepts can also treat dust found on the interior side of your panes, and will use ladders and sponges to access out of reach corners. A: Our water has been filtered from all naturally found hard minerals. As a result, it will efficiently absorb all streaks on its path and will vaporise under the sun without leaving residue marks of its own. A: Yes, the Shadwell window cleaners will come with the latest cleaning gadgets to wash commercial buildings both short and lofty. The pros can also perform additional cleaning tasks, such as patio washing and gutter cleaning. A: Absolutely. The team's water-fed rod is linked to a special filtered water tank inside the washing caravan. In case the water has been used up, the specialists will kindly ask you to provide them with any inside or external water source. A: Yes, all our services are comprehensively insured for your ease of mind. However, our washing approach is among the soundest that you can find on the market and we'll make sure to rinse your casements without leaving a single scrape mark! When you schedule a window cleaning Shadwell session, you'll be able to rejuvenate the panes of any property at reasonable fees that remain unaltered by minimum contracts or hidden payments. See if you agree with our opinion – stop by our useful price table below. 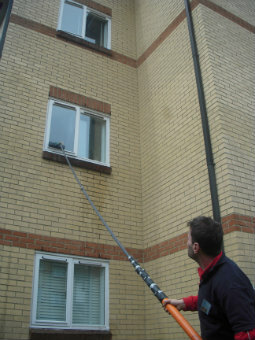 With window cleaning in Shadwell, you can efficiently remove old blemishes from any commercial or residential property. Continue reading to learn how. To wash your windows' exterior facet, the experienced window cleaners in Shadwell will deploy a new cleaning gear – a water-fed pole that runs on purified water. The cleaning tool's significant reach (22 metres) allows the technicians to banish muddy streaks from any four-storey domain without using ladders or unpleasant cleaning products. To tackle stains on rise buildings, we've come up with a wholly different cleaning method – the rope access window washing. After assessing your property's dimensions and whereabouts, a team of reliable abseilers will either use ropes or ladders and squeegees to reinstate the former glory of your windows. We always plan each session in advance to avoid injuries and can give you all the necessary COSHH reports upon request. To polish windows in-house, the specialists may have to carry squeegees and ladders to reach higher areas. We are happy to announce that our window cleaning in Shadwell has been requested by several adjacent regions as well. You can learn which regions we visit below. Alternatively, get a free instant quote or order affordable window cleaning services Shadwell E1 online, through our web site.